Kids Trike Motorcycle Electric Ride On Motor Bike LED Lights Music Battery. Material: Metal, PP Colour: Red & Black / White & Black Product dimension: 120L x 60W x 65H cm Seat size: 41L x 20W x 8H cm Seat to floor height: 47cm Suitable age: 3-8 years old Weight capacity: 25kg Net weight: 15kg Flat pack: YES Assembly required: YES Other Key Info: 2 x motor: 12V, 35W; 1 x battery: 12V, 7AH; 1xcharger: 12V, 1000Ma; Speed: 3-7km/h Custom label: 370-036RD(Red & Black) / 370-036WT(White & Black). This great looking kid motorcycle from HOMCOM is the ideal way to all the job for your kids. 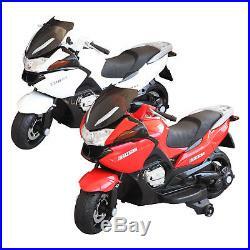 It features dual motors and 12v rechargeable battery offering a ride time up to 40 mins on single charge. Manufactured with lightweight yet durable materials provide improved maneuverability, transportation and storage. The bike comes with central section wheels for added stability and safety. Certified by EN71-1-2-3, EMC, EN62115 standards. Children can easily control the speed with the foot pedal for its simple acceleration. Motocross style ride on motor bike which drives forwards, left, right with sound and light effect at the front. Suitable age range: 3-8 years old; Max. 2 x Motor: 12V/35W; Max speed of 4.35m/h Rechargeable 12V/1000mA battery runs time up to 40 minutes on one charge depending on road condition and user weight. With EN71-1-2-3, EMC, EN62115 certification. MH STAR verifiably manages retail globally with branches in US, Canada, Germany, Spain, Italy and France, we now welcome you to benefit from our prices in the UK. Here at MH STAR, our point is to give you the most ideal choice of great quality on affordable items. Our quality essentially represents itself. All MH STAR items come exclusively from our carefully picked, quality assured alliances. Our goal is to keep up exclusive expectations for the value and services to ease your life. In the event that you require any assistance, kindly don't hesitate to get in touch with one of our accomplished and friendly advisors who will be glad to help, our customer service aim answer to your enquiries within 24 hours. We are unable to change this address for your own safety once the order has been placed. If you change your mind and wish to return the unused items to us, it must be done so within 30 days of the item being delivered. However, if you have any issues in regard to your order, we have a dedicated UK based customer service centre who will be delighted to help and resolve any issues that may arise. The item "Kids Trike Motorcycle Electric Ride On Motor Bike LED Lights Music Battery" is in sale since Thursday, October 26, 2017. This item is in the category "Toys & Games\Outdoor Toys & Activities\Ride-on Cars\Electric & Battery Powered". The seller is "2011homcom" and is located in London. This item can be shipped to United Kingdom.